The ten things that had me excited for the relaunch? As in, the don’t excite me anymore? Hardly! The idea for this post is just to take a look back at the little countdown series I did in July of last year, just as we were waiting for the new Daredevil #1 to come out. Which things on the list excite me even more now and are there any that have fallen short of what I had expected? Below is the list of topics I brought up then (click each heading to go to the original post), and my thoughts on what’s happened since. Obviously, when it comes to the series as a whole, it has by far surpassed my expectations. As spoiled as we Daredevil fans often are, I can’t remember a time during my seven years of reading Daredevil on an ongoing basis that I’ve been as eagerly awaiting each issue as I am right now. Nor can I remember being as compelled to read each issue over and over again. But, enough gushing, let’s get down to business. 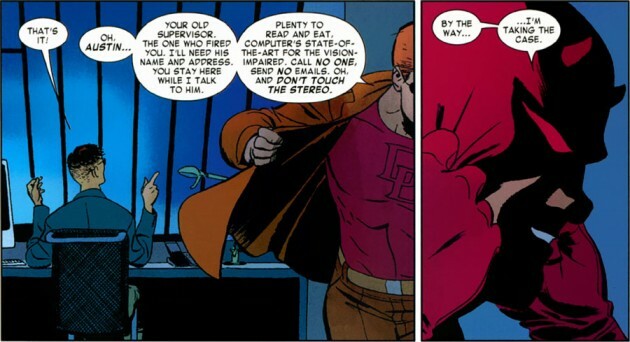 While this new way of drawing the radar sense has since become standard – guest artists like Emma Rios (Spider-Man #677) and Kano (Daredevil #8) replicated it and now Chris Samnee can be seen doing the same thing – it was Rivera who first introduced it. 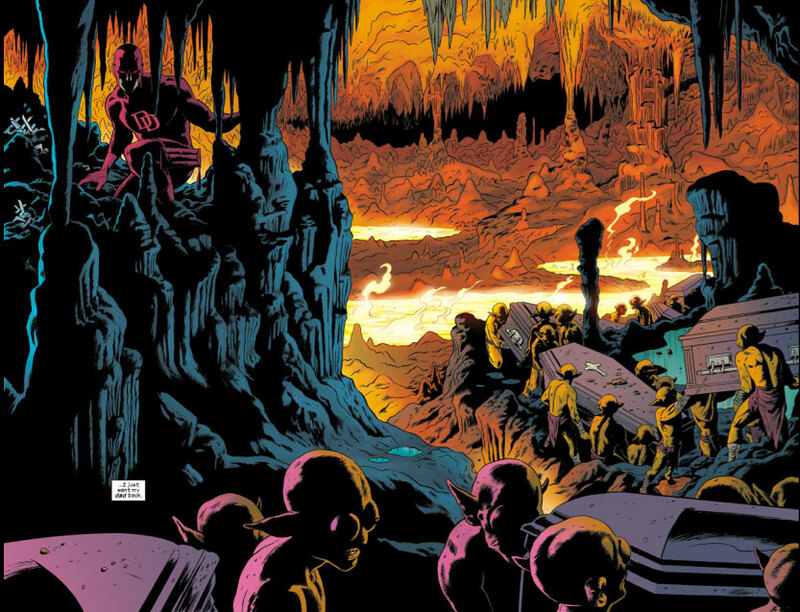 The panel that originally caught my attention and became the inspiration for the original post was the one of Daredevil “looking” at the Spot (see below), and I know I wasn’t the only one whose jaw dropped at the sight of it. Needless to say, the way the entire art team has dedicated themselves to trying to portray Daredevil’s senses has been a constant source of joy. What makes the radar sense in particular so difficult to convey is that it consists only of relative depths, and a sense of absence versus presence while lacking color information. The way us real life sighted humans go about things is to construct a sense of space from a two-dimensional color or grayscale image (using binocular vision, motion parallax and other clues) where colors and nuances tell us everything. In many ways, these two ways of seeing are each other’s complete opposites. One constructs a sense of space from an image, the other constructs an image from a sense of space. 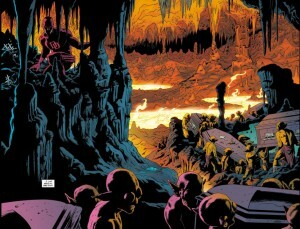 One is also a perfect fit for the comic book page whereas the other forces artists to come up with the kind of topographic representation that Paolo Rivera pulls off here. While it can never be more than a model for imagining the unimaginable, it is a very fine representation. The image of the Spot here was indeed the start of something great. This is certainly something that Waid has been very successful in doing. The book as it is now is a very different read compared to what we’ve seen in the last few years. At the same time – and this is the amazing part – almost all fans have welcomed the change. Apparently, what the new creative team has brought to the table was something fans wanted and needed without even knowing it. Many have come out and said that they were skeptical of the changes before finding themselves firmly onboard. At the same time, I have to admit to frequently wincing in disagreement (I think I just came up with a new expression…) whenever I hear anyone compare this run to the classic original run by Stan Lee or anything else from the Silver Age. I don’t quite understand why fans and critics are so eager to try to label it at all. The comparison with Stan Lee’s run is so superficial that it completely misses everything that’s great about this book right now. Even worse, I think that using labels like swashbuckling, and “classic superhero” actually risks alienating many people who might actually enjoy these recent Daredevil issues. It’s not that they miss the mark, but that they are insufficient when it comes to describing what I feel is very multi-dimensional body of work. 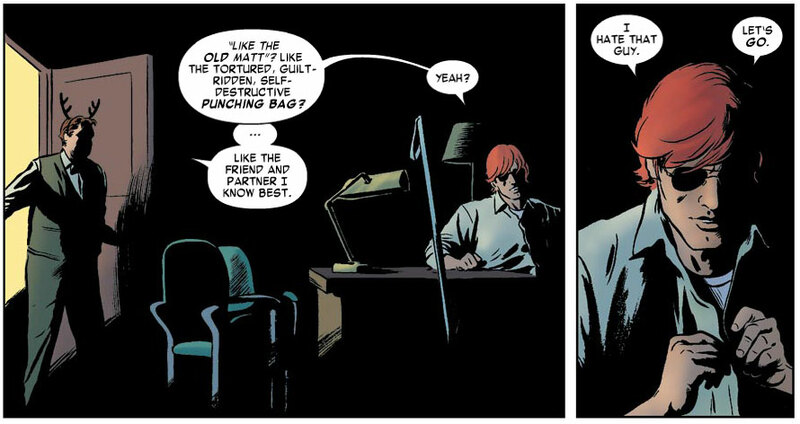 Yes, volume three of Daredevil is fun, has lots of fantastic action, and a new brighter outlook for the main character. At the same time, these tales have not been superficial or inconsequential. They may be fun, but they are never goofy. And Matt may smile more often, but there is still a definite sense of his being a man desperately struggling to regain control of his life. None of the characters are caricatures, they are creations of genuine depth and the stories told about them make you care about what happens next. I suspect that it’s these qualities that have made seasoned fans want to stick around because the best Daredevil stories have always been the ones that are the most character-driven. The reason Mark Waid has been able to shake things up the way he has is because he has such a firm grasp of who Matt Murdock is. That’s what I believe readers appreciate. This was also inspired by a quote by Mark Waid. One of many, in fact, that have touched on the fact that Daredevil is not just about amazing heightened senses, fighting skills and athletic prowess. There’s also the too rarely touched on, yet blatantly obvious, fact that the character’s blindness carries with it real consequences. For much too long, Matt’s blindness has been dealt with – to the extent that it’s been dealt with at all – as something that is completely offset by his heightened senses or simply as a matter of esthetics. I guess many creators have just seen him as “differently sighted” and never stopped to think about what that really means. While Daredevil’s heightened senses, the radar in particular, leaves his level of mobility unaffected or even improved (except for when it comes to driving or finding a particular location in an unfamiliar area), the average person has access to a wealth of visual information that lies firmly beyond Matt Murdock’s grasp. The areas that Mark Waid has focused on the most in interviews has been the increasing significance of screen-based information in modern society and this is clearly one of the more obvious things that would present a problem to someone who perceives only depths and shapes. Waid has also talked about how getting inside Matt’s head is something he comes back to time and time again in whatever situations he finds himself in and I’m just incredibly grateful that he brings this level dedication to the task of writing this complex character. As any regular reader of this blog knows, this is a topic of great interest to me. However, it’s been gratifying to realize that I’m not the only one who seems to care. I’ve read countless reviews where critics have pointed out how it’s become much more obvious these days that Daredevil can’t see and every single one of them has intended such statements as compliments. This was an art appreciation post. 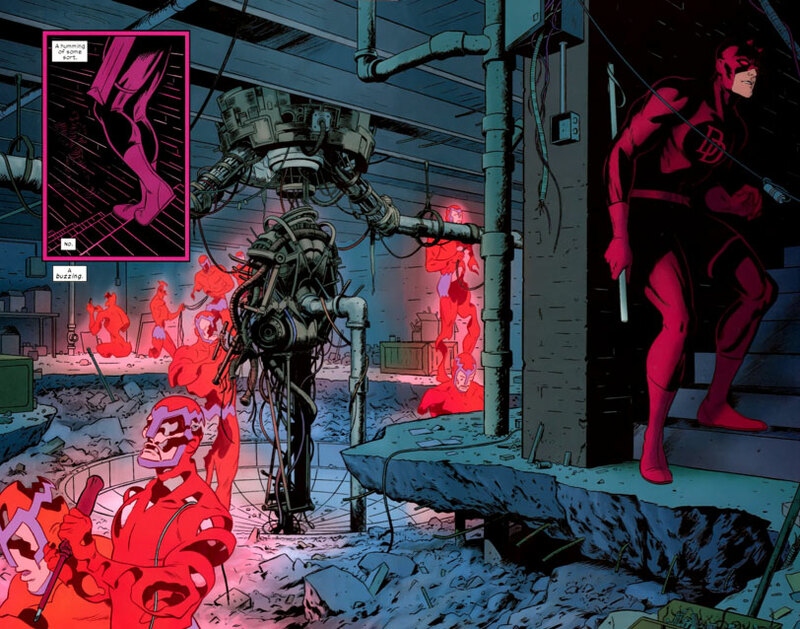 More specifically, my appreciation was aimed at the preview images of Marcos Martín’s two-page spread that featured Matt and Foggy walking across the page, as well as the Daredevil and Captain America spread from Daredevil #2, by Paolo Rivera. Obviously, I’m still digging the art and how splash pages, when they used in the current run, are not only stunning to look at but have an obvious purpose. Too often in comics, big brawl spreads, while usually nice to look at, come across as filler. I’m sure they take ages for the artist to complete, but when used too often and in lieu of plot progression they make for an unfulfilling and much too brief reading experience. Rather than go back to the pages featured in the original post, below you’ll find some examples of “big art” (as I jokingly phrased it in the original post) we’ve seen since then. 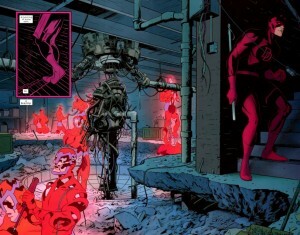 On the left is an example from Daredevil #2, and on the right is one from Daredevil #9, both by Paolo Rivera (inks by Joe Rivera and colors by Javier Rodríguez, of course). Another page that would fit in well right here is that great looking first page from Daredevil #12, by Chris Samnee that I talked about in my last post. Ah, the cast. You know how I feel about the supporting cast, the book wouldn’t be complete without it and there is plenty to indicate that Matt’s friends and associates will take on even bigger roles in coming issues. We have newcomers in the form of Kirsten McDuffie (and let’s not forget that Foggy has played nookie with her room mate), and Austin Cao, in addition to good old Foggy Nelson. One thing that Mark Waid mentioned early on though was that the law firm was going to have a very annoying new secretary. We’ve met the secretary – in Daredevil #4 – but haven’t seen much of her annoying side just yet. In general, this would be the only item on the list where the full potential has yet to be realized. I expect this to change in coming months though. Speaking of the cast, it also consists of a growing list of villains. And there’s not a ninja in sight! 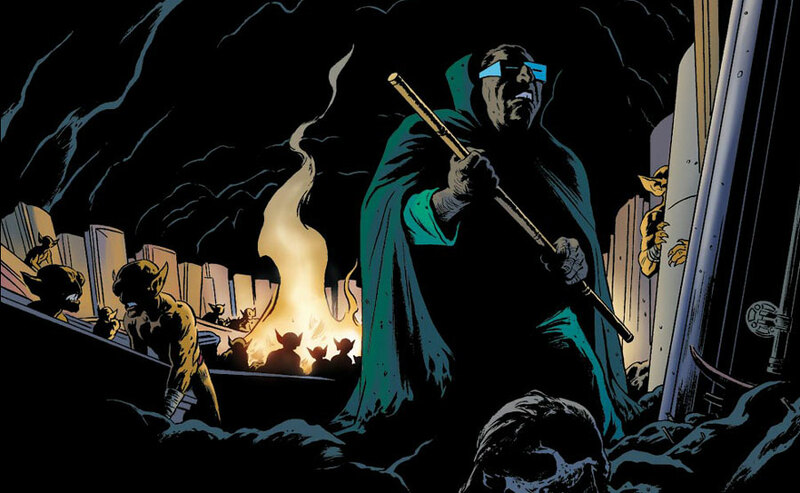 The Hand and the Kingpin are excellent adversaries for Daredevil and when either one makes a return, I’m sure something good will come of it. If that’s not for a few years though, that’s totally fine with me. This was one of those things that probably wouldn’t strike most readers as a particularly big deal, but I will honestly say that it would have bugged the heck out of me if they hadn’t gotten it right. Thankfully, they did. Paolo Rivera even managed to make the cane work believably as a billy club without sacrificing the qualities of either one. Not much to say here except, bravo! I really liked Ed Brubaker’s use of (lots of) internal dialogues for Matt, and it was something I missed for most of Diggle’s run. When used well, those little caption boxes make us feel closer to the character(s), and in the case of Daredevil, the internal monologue becomes yet another way for the writer to describe to the reader exactly how Daredevil perceives a situation. So far, Mark Waid has made liberal use of internal monologue for this purpose and I think it helps us get into his head a little better. How was Waid going to focus on Matt’s career while changing things up by having him serve the law in a different capacity? I know we were all scratching our heads until it was revealed that Matt and Foggy were now in the business of helping people help themselves, that is coaching them to represent themselves in court. The way this idea has played out has been great. It’s given us plenty of Matt and Foggy time around the office without subjecting anyone to long court room scenes while at the same time functioning as a plot device for introducing new cases for Matt to deal with in his Daredevil guise. Matt still gets to be in the lawyering business, and he’s even found a new potential love interest in assistant D.A. Kirsten McDuffie. I can’t say how happy I am that this finally happened! What’s great about the new take on Matt though, is that it really isn’t about wiping away his years of heartache – first of all, it’s abundantly clear that he’s in some kind of denial – but that it gives the character back his full range of emotions. We’ve seen him during some darker moments (see below for what is clearly a crack in the surface), and he recently (see Daredevil #9) let his judgement give way to anger for the first time in a long time. They key here is that Daredevil has not been transformed into a completely different character that’s all about fun and games. What we see is more a case of Matt being portrayed as a complete human being, and moving away from his portrayal as so down on his luck that he almost seemed like caricature from one of Shakespeare’s tragedies. Matt at his worst was not a relatable character. I’ve said several times that Matt Murdock is like a great actor who’s unfortunately been type cast into playing only one type of role (the one that brought him the greatest commercial success). We finally get to see him oscillate between different moods in a way that seems more natural and is, quite frankly, a whole lot more engaging. Well, this was my look back at the details and developments that appealed to me about the relaunch before we had even read the first issue. It is incredibly rewarding to be able to return to the expectations I had, and realize that this book has more than delivered in every respect. What were some of your hopes and what do you hope for down the line? Agreed on every point. Though with one slight difference. I am very glad to be rid of The Hand/Kingpin/Bullseye for long while. I’ve said this before, I do miss Matt Murdock as a ninja. He can be a ninja without having to always fight ninjas. @Robert – How is Matt not a ninja now if you considered him one before? He does crazy acrobatics and sneaks around and hits people with sticks. What was more ninja-y in other runs, other than him fighting/hanging out with ninjas? @Aaron. I agree, there is nothing in the books saying he’s not a ninja. I do think that aspect of DD is being downplayed, possibly because there is no need to specifically reference the ninja stuff when he’s not fight enemies of the ninja/mystical art variety. This is still, hopefully, very early in Mr Waid’s run on the title and he might add more ninja stuff, but I doubt it. Maybe “ninja” is the wrong word for what I’m trying to say. I just don’t think Waid is going to show us Japanese wall scrolls hanging in Matt’s home, or Matt meditating naked, surrounded by candles, to ease pain from a fight. This a very, very minor complaint, also. I think Waid and the various artists are knocking it out of the park. @Robert: It seems to me that what you’re referring to are things I generally just associate with the Bendis run (and, to a lesser extent, Brubaker’s). As in, they’re there, but it’s not necessarily something that’s standard Daredevil paraphernalia in a broader sense. 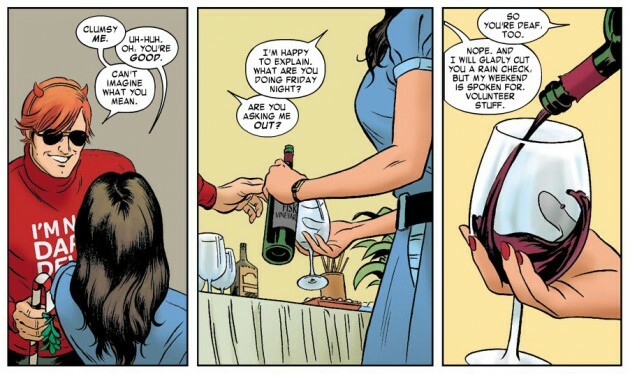 As long as I’ve been a Daredevil fan though, I’ve always allowed myself to sort of insert things between panels/issues that I feel are central to the character but may not be seen that way by the current writer, so I think you should feel perfectly free to imagine Matt having all kinds of crazy things around the house. 🙂 As for what he puts on his walls, that’s more for other people to look at (speaking of which, isn’t it kind of random for him to have a NY subway map by the front door as seen in DD #5?) so he could certainly have a stash of ninja literature/art to peruse or enjoy in his own way somewhere. I think you’re right, and do not sound “out there” at all. I think a lot of comic fans (at least others I know) do exactly that, “insert things between panels/issues that I feel are central to the character”. I know I do too. Matt spent years — decades, even — perfecting skills such as meditation and martial arts, both as a means of honing his natural skills and of dealing with the potential sensory overload of his enhanced senses. These are bound to be a major part of his life, even if they aren’t a part of the characters around him. I guess I’d just like to see Matt doing Tai Chi on the roof while he and Foggy go over somebody’s case, is all.